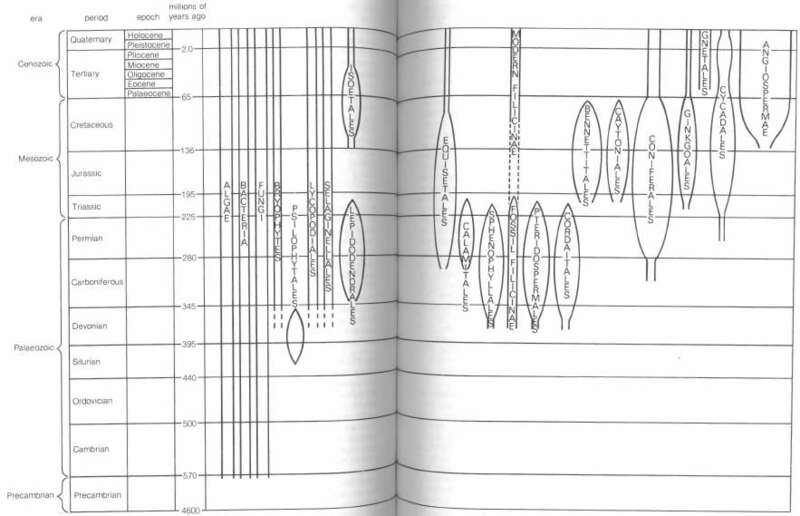 A table showing the sequence of the geological periods and the lengths of time they are assumed to have occupied. It has been constructed by studying rock strata, where these have been exposed by excavations or mining or where rivers have cut deeply into the earth's crust. It may be assumed, providing there is no evidence of large earth movements, that the lower the rock layer, the older it is and the more ancient are the fossils it contains. With a knowledge of rates of erosion and deposition the intervals occupied by the different periods can be very roughly estimated by measuring the relative thicknesses of the strata. However considerably more accurate dating can now be provided by measuring the rates of decay of radioactive materials in the rocks (see radiometric dating). The results of such work are summarized in the table, which also shows the types of plants that have been found and their very approximate relative abundances. The earth is estimated to be about 4600 million years old and life is believed to have originated about 3000-3500 million years ago. Complete agreement on the terminology used in such tables has not been reached. However, generally the major divisions are eras, divided into periods, which are then subdivided into epochs. The different periods are recognized on the basis of changes in fossil composition and the occurrence of major geological events, such as episodes of mountain building or major changes in the level of the seas. The earliest era, the *Precambrian , has few fossils. The succeeding *Palaeozoic , *Mesozoic , and *Cenozoic eras have abundant fossils. The geological time scale showing the approximate time of origin and the relative abundancies of different plant groups.